Bookings are secured with a 50% deposit of the fee, normally paid by BACS. Cancellations within 1 week of the arranged day will be reimbursed. If you have any allergies we should know about please let me know in advance. Increasingly in this age children and some adults are prone to reacting adversely to fibre, etc. Weather conditions can vary considerably, especially in Spring and Autumn, so it is important that visitors bring suitable attire for their visit. This includes suitable footwear such as wellington boots or walking shoes. Surfaces on the farm or on local bridleways can be slippery and uneven. It can also be muddy in places following heavy rain. Protection for the head is advised whether to shield it from the sun or hold off rain. Umbrellas are not suitable substitutes as they tend to frighten the llamas. Hillview Llamas is approx. 15 miles from Chester, 20 miles from Liverpool and 30 miles from Manchester. It is 4 minutes from junction 12 of the M56 motorway. Frodsham is on the main rail line to North Wales and 20 minutes from both Manchester and Liverpool airports. Visitors are asked to find their way to WA6 7EP. At the small roundabout, turn right into Watery Lane and park on the grass verge opposite the entrance gate. If no one is there to greet you please call 07985854393. Llamas are very gentle and sensitive animals. They tend to be shy at first but gradually warm to new visitors as their confidence grows. You are advised to let them approach you and an effective way of greeting them is to blow gently on their nose. Try to remember not to raise your hands, especially to stroke them on the head since this invariably frightens them. After they have said hello, the first place to try touching them stroking down their neck at the front. Try to remain quiet and calm to win their confidence. Children, understandably tend to get excited but jumps and /or shrills of delight tends to scare them and set back the familiarisation process. It would be very unusual for a Hillview Llama to kick, bite or spit at you. They usually only spit at each other when in dispute such as over a limited supply of food or amongst males when fighting for dominance/supremacy. 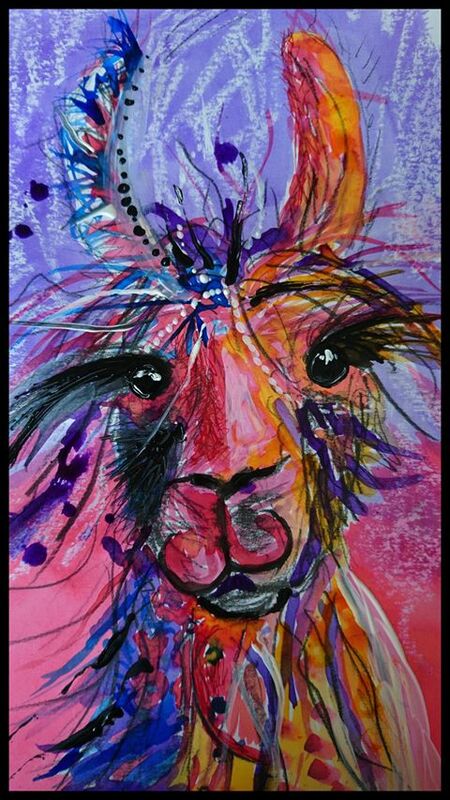 Some like human attention more than others and If you read about them on the Hillview Llamas website you will get a bit of an insight into their very individual personalities. Don’t panic if one decides to unzip your jacket, take your hat off, untie your shoe laces or have a go at pulling a motif off our designer clothing. Donte has quite a collection and is especially fond of the Puma tick. Llamas are very sensitive to their legs being touched since speed of movement is their main defence. You are advised at all times not to stand too close to their back legs in case they do kick back. It may be in response to a wasp or fly. Similarly, if a llama lowers its head, to smell you shoes for example, don’t be tempted to follow it down since it may raise it very quickly and I once got a black eye this way. When leading llamas they generally prefer a loose reign. Pull them in tight and they generally stand still or become stubborn about not moving forward. When trekking, watch out for loose dogs or birds such as pheasants that may jump out of the hedgerow. Adult llamas are not usually frightened so long as they can see them. However, a quiet cyclist or jogger passing close by from behind can shock the llama so try to be its look out including for grates in the road, etc. although you will see they are very observant animals themselves. Llamas are hierarchical and so you will find that they establish their own order and may insist on being in a particular position in the line. Eg. the top llama usually likes to lead from the front and may get upset if overtaken by another llama. Fresh cold water is on tap as is anti-bacterial soap and disposable paper towels. We advise visitors to make use of these, especially if you plan to touch food soon after. Generally, there is nothing to worry about and you should have an enjoyable visit to Hillview Llama, as have previous visitors. These notes ae just to help you best prepare for your visit and ensure you make the most of it.